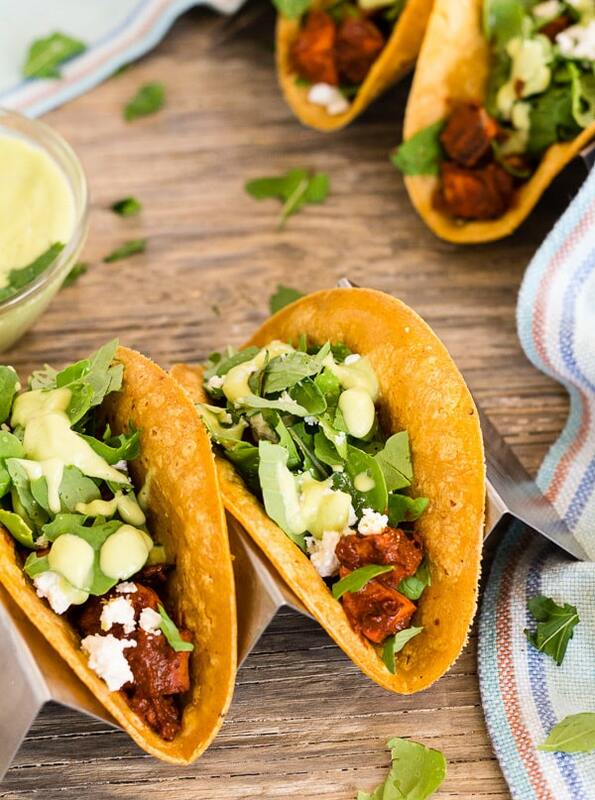 Soft corn tortillas filled with chile-sauced sweet potatoes, arugula, goat cheese, and tangy avocado crema. 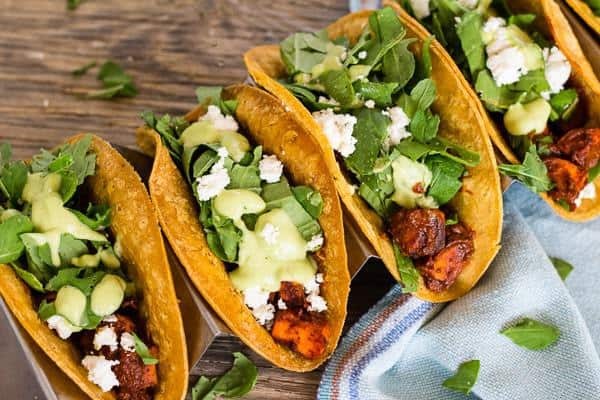 Sweet, salty, bitter, smoky, and spicy, these sweet potato vegetarian mole tacos are a happy mouthful of flavor diversity. The tender chunks of roasted sweet potato are tossed in a spicy brick-red chile sauce, either chile chocolate mole or red enchilada sauce or you can simply toss the potatoes with chili powder and other Mexican spices before roasting. Click here to PIN Vegetarian Mole Tacos! 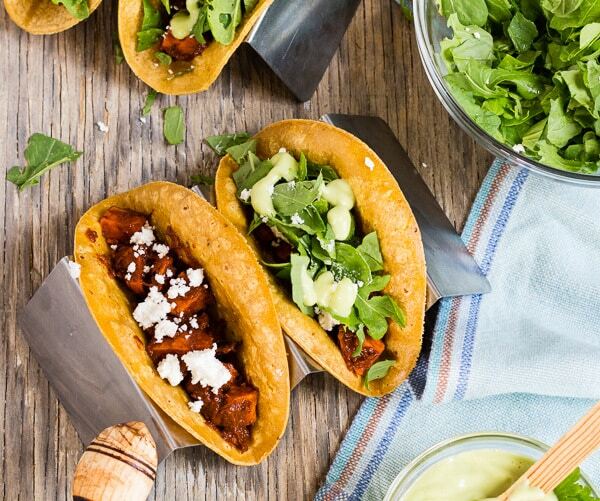 Spoon roasted sweet potatoes into warm corn tortillas, then top with chopped arugula leaves and goat cheese crumbles. 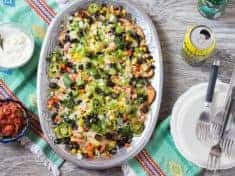 Finish with a big drizzle of this amazing avocado lime sauce! Yum! For vegan tacos skip the goat cheese. The avocado crema is simply ripe avocado blended with water, lime juice, garlic, and salt! It goes with all kinds of Mexican tacos and quesadillas. For vegan tacos skip the goat cheese. The avocado crema offers plenty of oomph to balance the spiced sweet potato and arugula flavors. For protein-strong tacos, mix cooked chickpeas with the potatoes and red sauce. 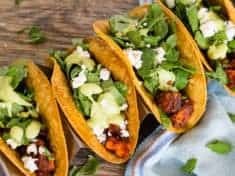 Like for these tacos, I toss the roasted sweet potatoes in my shortcut vegetarian mole sauce. But sometimes I’ll toss the potatoes in homemade authentic red enchilada sauce or a quick and easy enchilada sauce made with chili powder. 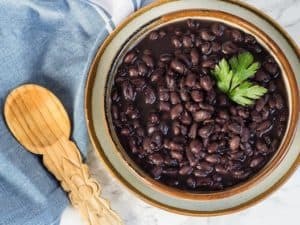 You can also just roast the sweet potatoes with olive oil and a mix of chile powder, paprika, and cocoa powder, or a purchased mole spice blend. Robbie will tell you I’m very picky about my tortillas, both corn and flour. For corn tortillas, Mi Rancho brand’s organic corn tortillas are hands-down winners. They taste like real corn. Seek them out. 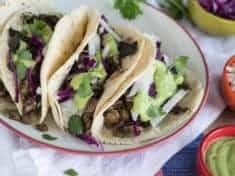 You need only 1 cup of homemade chile chocolate mole sauce for these tacos and my mole recipe makes six cups. Freeze the extra mole in smaller containers to use when you want. The spicy, smoky mole is excellent with vegetable enchiladas and over the top of hot grilled vegetables. 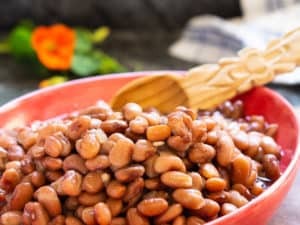 To soften, spray with cooking spray, and warm them in the oven, or on the grill. Freeze your tortillas if you don’t plan on using them right away. Mi Rancho caught me raving about their tortillas on Instagram and sent an assortment of their organic tortillas to play with. 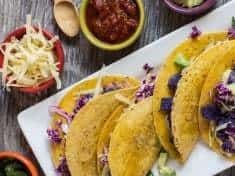 We’re sold on the 4-inch corn tortilla “sliders” for tostadas–you can bite into a crisp loaded tortilla without losing half of it all back to the plate! Wishing you a fabulous week–get in the kitchen and cook something healthy and delicious! Toss the roasted potatoes in mole sauce, enchilada sauce, or (before roasting) in a mix of olive oil, chili powder, paprika, cocoa powder, salt, and a pinch of cayenne. For vegan option, skip the goat cheese. Makes 8 tacos, figure 2 per person. Roast the potatoes, stirring every so often, until they are golden charred on the outside and soft to your bite, about 20 minutes. Stir in the mole or enchilada sauce. Keep warm. Have all the other ingredients ready before warming the tortillas. To serve, warm the tortillas. (I like to spray them with avocado cooking spray so they soften easily.) Fold the softened tortillas in half. Spoon about 3 tablespoons of the spiced sweet potatoes into each tortilla. Top with arugula and crumbled goat cheese, if using. Drizzle generously with avocado crema. Before cooking, toss the potatoes in a mix of: 2 tablespoon olive oil, 1 tablespoon chili powder, 1 teaspoon paprika, 1/2 teaspoon cocoa powder, 1/2 teaspoon sea salt, and a pinch of cayenne.